The Samsung C27F398 is a decent 27" VA monitor that delivers okay picture quality. It has excellent low input lag, very good motion handling, and it supports FreeSync, which is great for gaming. It has a very good native contrast ratio, that delivers good dark scene performance. Unfortunately, it has a fixed stand that can't be easily adjusted to an ideal viewing position, and it can't get very bright. The Samsung C27F398 has a decent, but basic design. Overall it is similar to the LG 24MP59G. It can be VESA mounted, which is nice as the stand has only basic ergonomics, and there is no cable management. It has decent build quality, but is made of plastic and feels cheap. Overall, you shouldn't have any issues with it though. 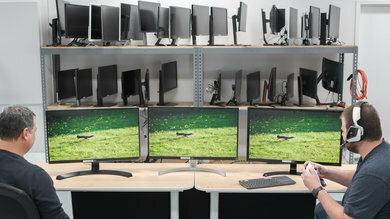 The stand has a very large footprint, similar to the CHG70. 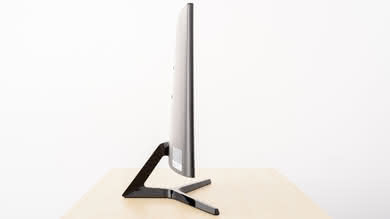 When the monitor is nudged there is little wobble, but the stand doesn't feel very sturdy. Unfortunately, the Samsung CF398 has terrible ergonomics. The stand can only tilt, so it is hard to place it in an ideal viewing position, and it may be preferable to VESA mount it. The back of the Samsung C27F398FWN is very plain. There are grooves across the entire back, and all of the inputs face out of the back, which isn't ideal if VESA mounted. There is no cable management. The borders are thin and look good. 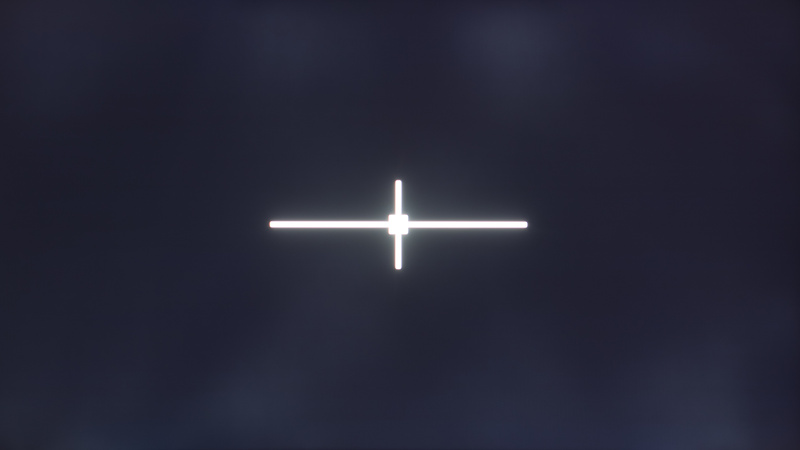 There is very little gap between the bezel and the first pixels. 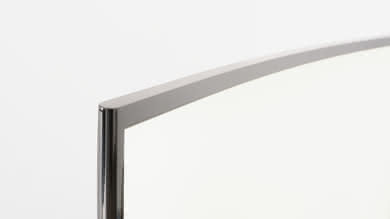 Due to the curvature of the screen, the C27F398 is thicker than most monitors. 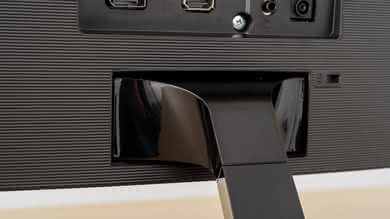 There is a small part of the stand that cannot be removed, which may cause issues when VESA mounted. Decent build quality overall. It is pretty basic, similar to the LG 24MP59G, and although it is entirely made of plastic there shouldn't be any issues with it. The Samsung C27F398 delivers decent picture quality. It has a very good native contrast ratio, which is great, but it has only mediocre black uniformity. 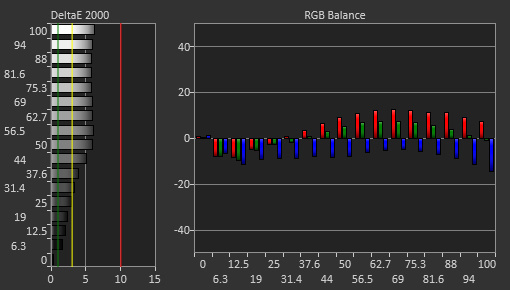 It has excellent coverage of the sRGB color space, but less than ideal coverage of the wider Adobe RGB color space. Unfortunately, the CF398 isn't very bright and has a hard time overcoming glare in a bright room, and the image degrades when viewed at an angle. The Samsung CF398 has a good contrast ratio, very similar to the CHG70, but worse than the MSI Optix G27C. Unfortunately, it does not have a local dimming feature to improve the contrast ratio. Decent peak brightness, slightly dimmer than the larger CF791. The brightness remains constant, regardless of scene changes, which is great. Disappointing horizontal viewing angles, but better than most VA monitors that we've reviewed with the exception of the Sceptre C325W. 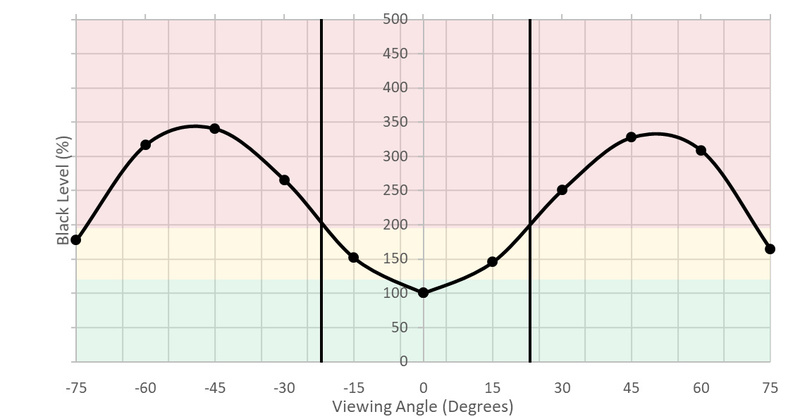 The brightness drops to half of the peak brightness at about 52°, which is decent, and colors degrade gradually when viewed off-center. Decent vertical viewing angles, again, better than most VA monitors. 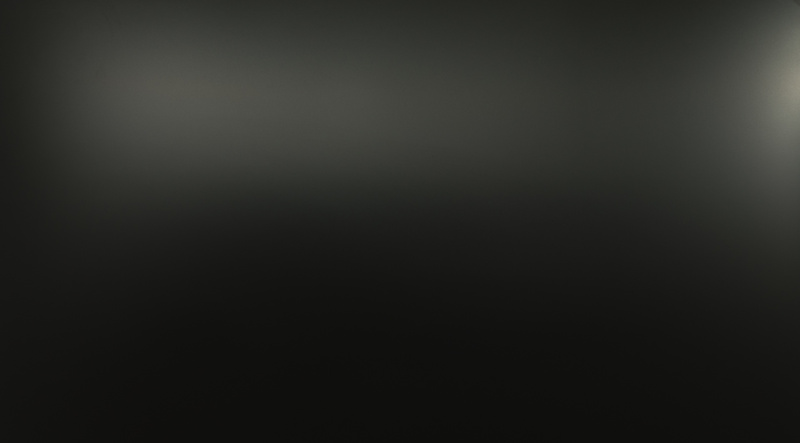 Unfortunately, the black levels increase rapidly when viewed even slightly off center.  The Samsung C27F398 has excellent gray uniformity.  The center of the screen is a bit brighter than the edges, but this shouldn't be noticeable under most viewing conditions, and there is very little dirty screen effect. In near-black scenes the uniformity is even better, and there are no issues. Mediocre black uniformity. 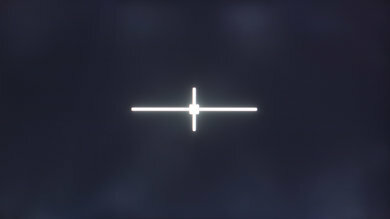 There are a few flashlighting spots that are noticeable when viewed from directly in front. 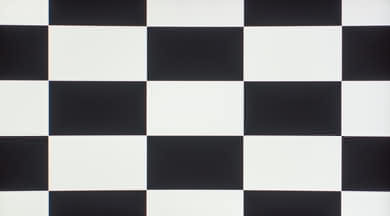 The black uniformity appears noticeably worse when viewed at an angle, due to the bad black levels at an angle. 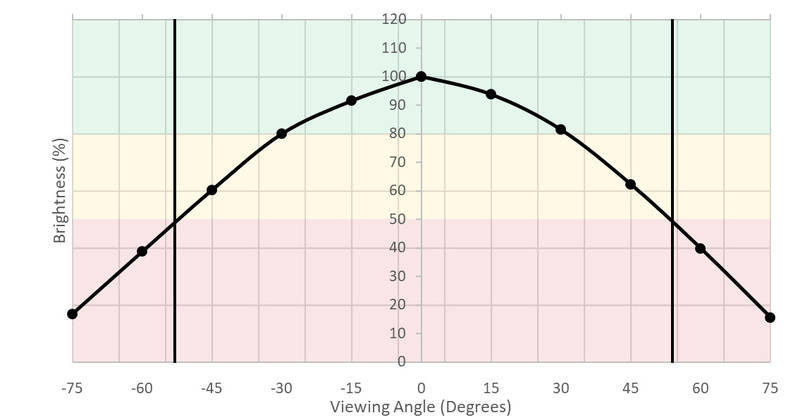 The Samsung C27F398FWN has mediocre accuracy out of the box. 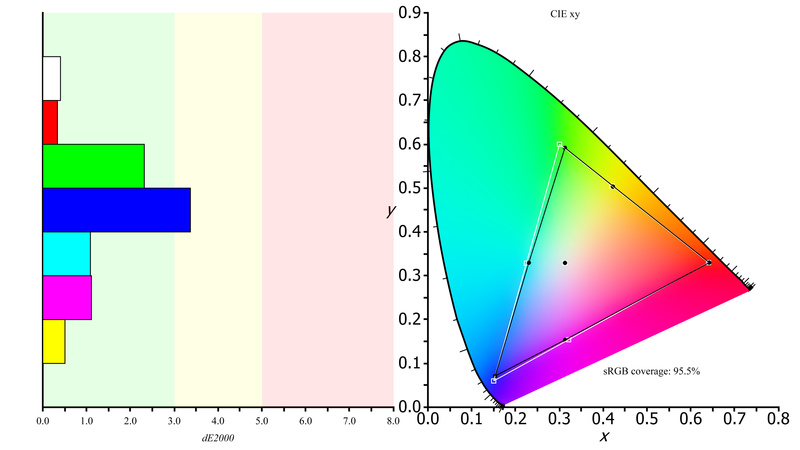 The color temperature is very warm, and the color error is high enough that most people will notice it. White balance error is even higher, and gamma doesn't follow the target curve. 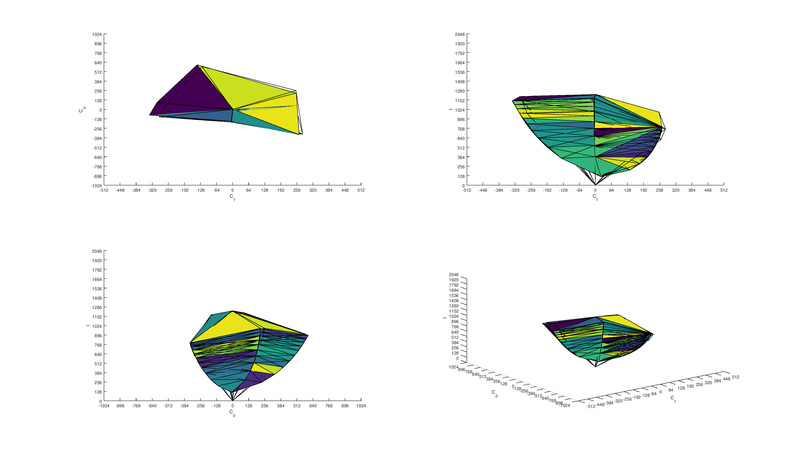 After calibration, the CF398 is nearly perfect. 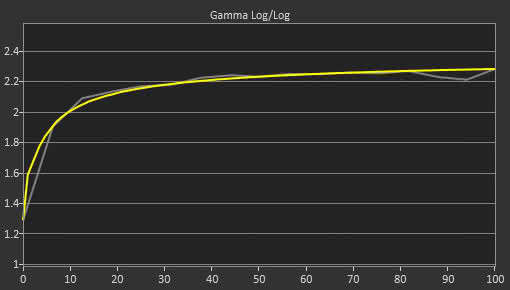 Gamma follows the target curve nearly perfectly, and the color temperature is almost spot on the 6500 K target. 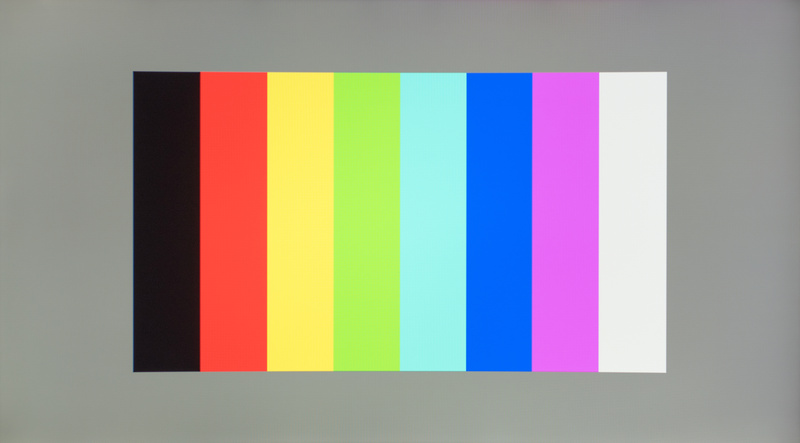 Color and white balance errors are nearly entirely corrected, but there is still a high blue error, but this shouldn't be very noticeable. Excellent SDR color gamut. Coverage of the smaller sRGB color space is nearly perfect, but coverage of the wider Adobe RGB color space is less than ideal for professional photo and video editing. 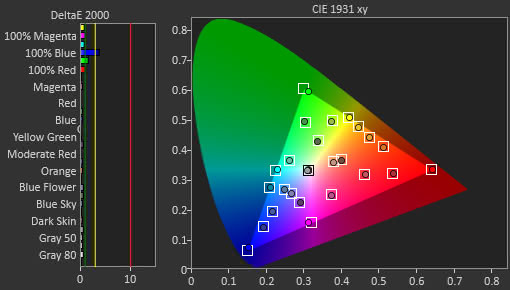 Unfortunately, the color gamut isn't as wide as that of the MSI Optix G27C. Excellent color volume. In the s.RGB color space it can fill out the gamut at most brightness levels, but it can't produce dark colors very well, and like most monitors, it can't produce very bright saturated blues. 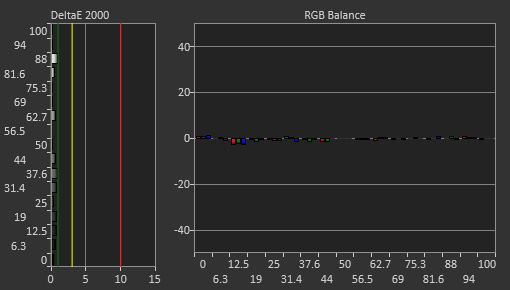 Adobe RGB coverage is limited by the color gamut, and isn't ideal for professional video editing. 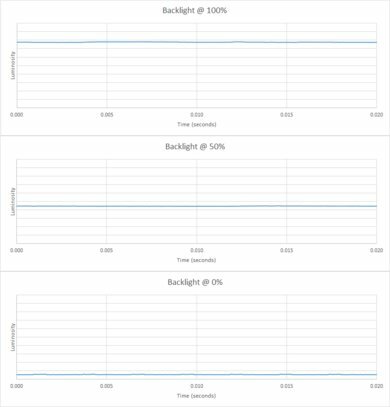 Perfect image retention performance, as there was no residual image even immediately after showing our high contrast test image for 10 minutes. 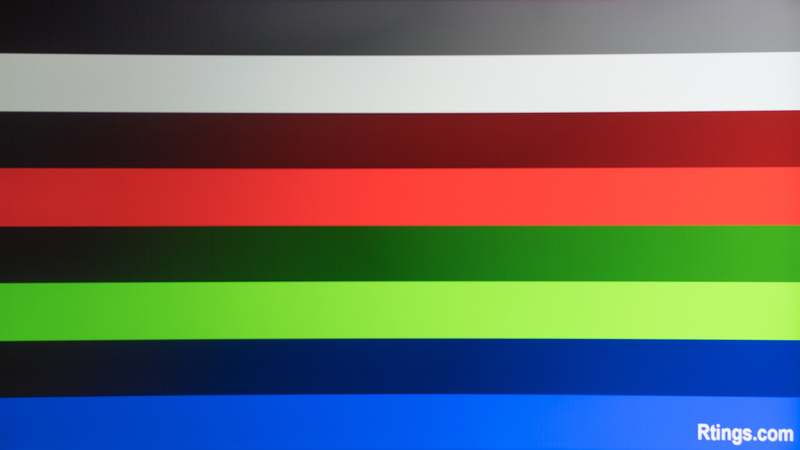 Great gradient performance, there is some banding noticeable in darker shades, but this shouldn't cause any issues under normal viewing conditions. Perfect color bleed performance, as there is no error whatsoever. Great reflections handling. 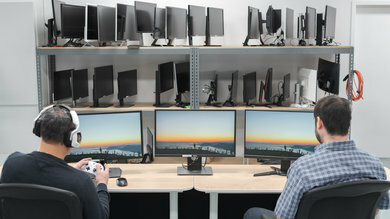 There should be no issues using the monitor in a bright room. The Samsung C27F398 has very good motion handling. 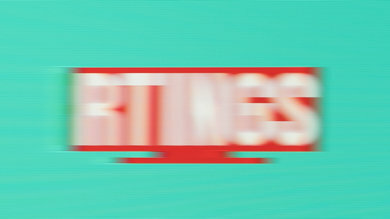 It has an excellent response time, and there is only slight motion blur behind fast moving objects. The backlight is completely flicker-free, which is great, but it does not have an option to add flicker in order to improve motion clarity. 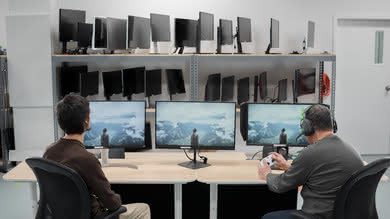 It has a native 60 Hz refresh rate, which may be disappointing to some gamers, however, it can easily be overclocked to 72 Hz, simply by enabling the FreeSync mode in the monitor's settings, even when connected to a computer that isn't compatible with FreeSync. 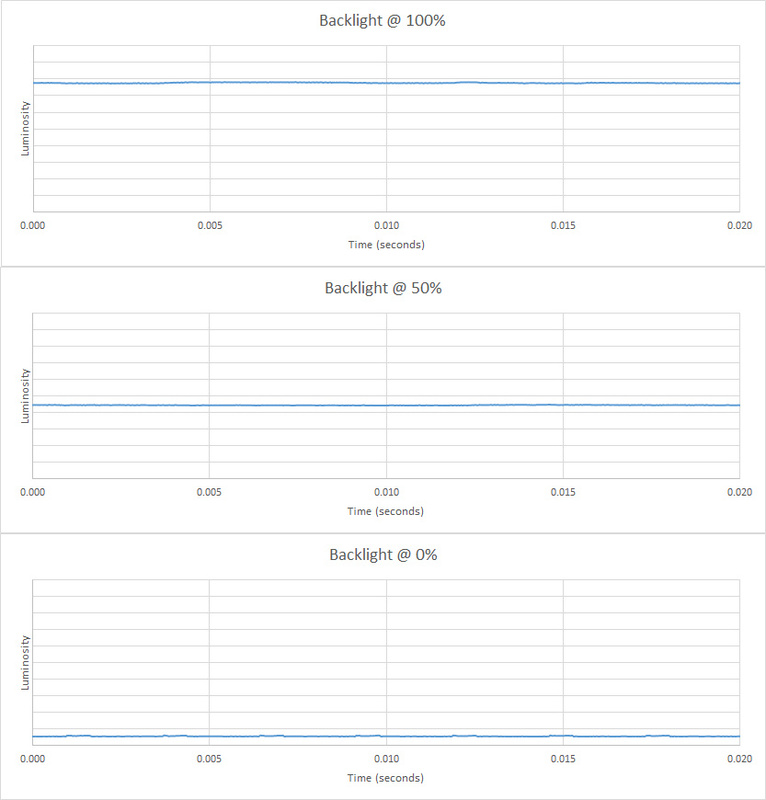 The CF398 has an excellent response time. It has an adjustable Response Time setting, with three modes, and we recommend the 'Fastest' option. 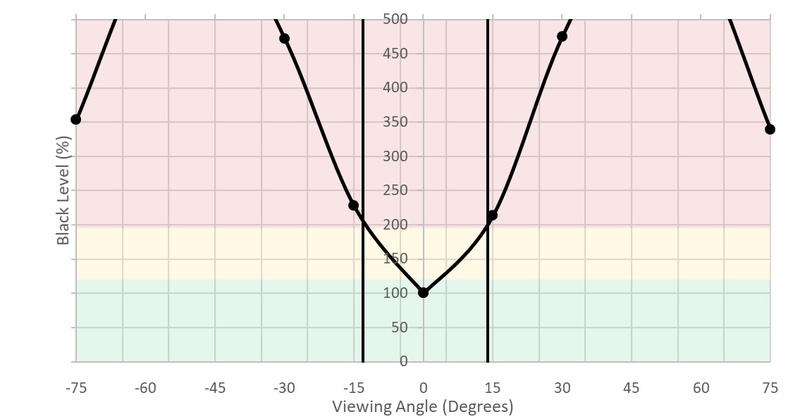 In this mode, there is some overshoot in a few transitions, and a small amount of undershoot in a few down transitions, but neither of these are significant enough to be noticeable under most viewing conditions. 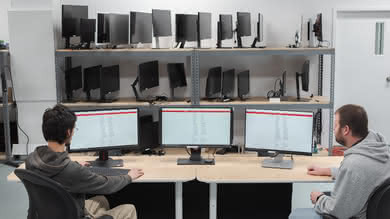 Although the monitor's refresh rate can be increased to 72 Hz, the response time was measured at 60 Hz. 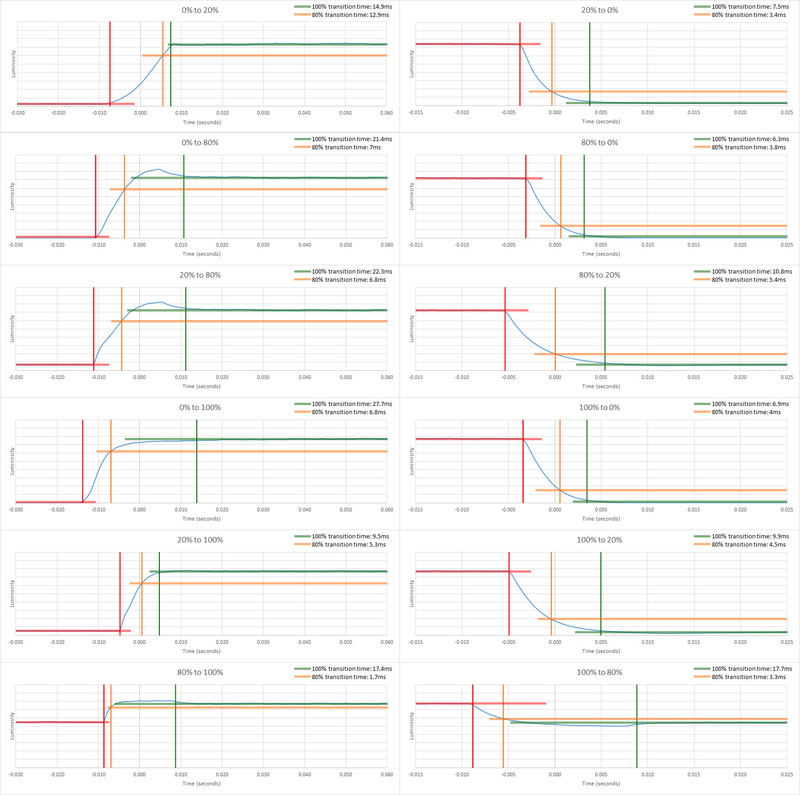 At 72 Hz the response time is probably a bit better. The Samsung CF398 is completely flicker-free, which is great. Unfortunately, it does not have an option to add flicker in order to improve motion clarity. In all cases, 72 Hz is displayed properly with no dropped frames. 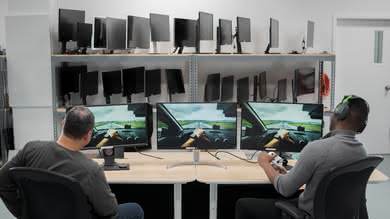 Update 01/15/2019: We have retested the CF398 with NVIDIA's new FreeSync drivers, and there were no issues with either FreeSync mode. The image was tear-free up to about 72 Hz. The Samsung C27F398 has excellent low input lag that should please most gamers. Unfortunately, although the 27" screen is a good size, the 1080p resolution isn't ideal for multitasking, and it doesn't provide a very immersive gaming experience. 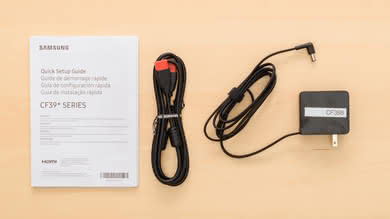 It has only 2 inputs: 1 HDMI port and 1 DisplayPort, so it isn't great for connecting multiple devices or for legacy devices with only analog outputs. 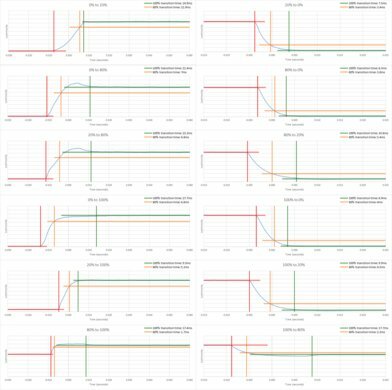 Excellent low input lag when gaming at the native 1080p @ 60 Hz, and even lower input lag when in FreeSync mode at 72 Hz. 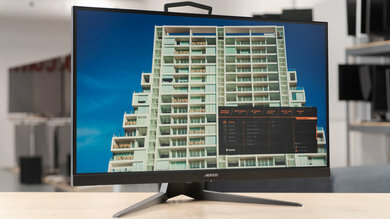 The Samsung C27F398FWN has a good sized, 27" screen, but most people will probably be disappointed by the 1080p FHD resolution, as it isn't great for multitasking. 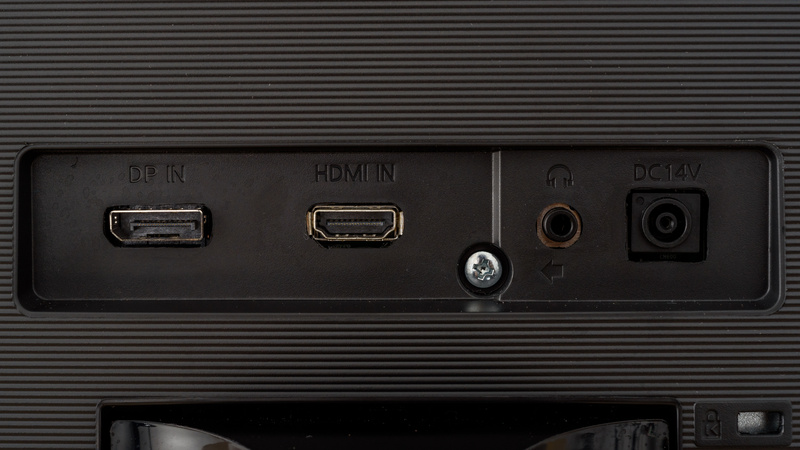 There is a single HDMI and a single DisplayPort input, but no VGA or DVI. There is a 3.5 mm port that is a headphone port with adjustable volume using the OSD volume setting. 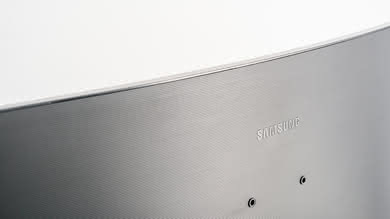 The Samsung C27F398FWN has very few additional features. It does not have internal speakers and it does not support HDR.  There are no options to improve gaming performance, but there is a Game Mode that adjusts the contrast and brightness to make it easier to spot other players hiding in the shadows. 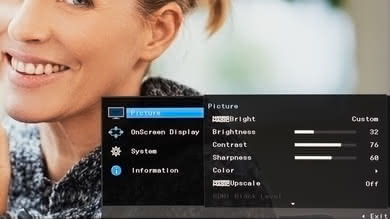 The Samsung LC27F398FWNXZA has no significant additional feature. There is no HDR support and it doesn't have internal speakers. 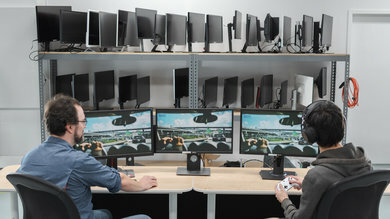 The Samsung CF398 uses a joystick, similar to the CHG70 and to LG monitors. It is very intuitive, and makes the OSD very easy to navigate. 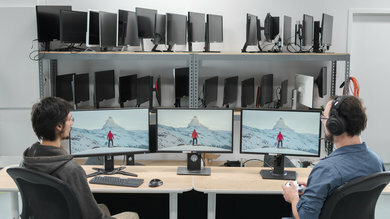 We tested the 27" CF398 (LC27F398FWNXZA), which is the only size available. There are other models available with similar specifications, but we don't know how they perform. 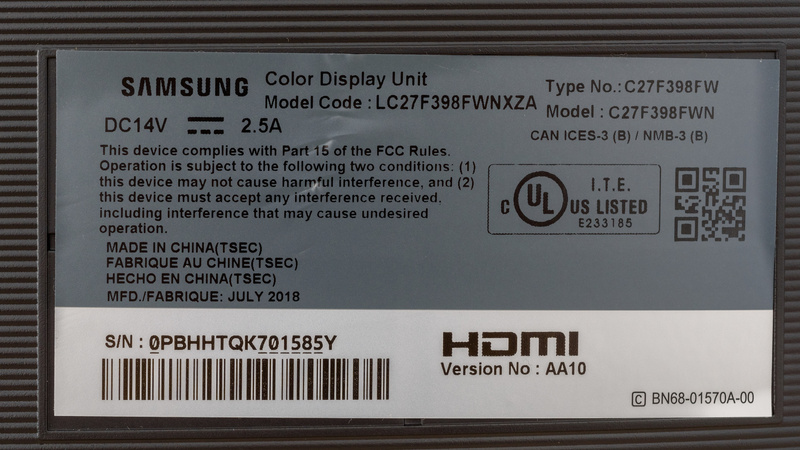 If someone comes across a different type of panel or if their Samsung CF398 doesn't correspond to our review, let us know and we will update the review. Note that some tests such as the gray uniformity may vary between individual units. 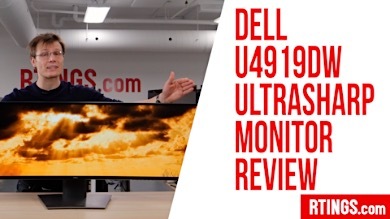 The CF398 we reviewed was manufactured in July 2018. 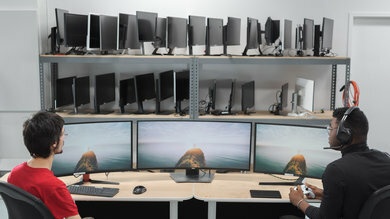 Left: ASUS VG248QE. 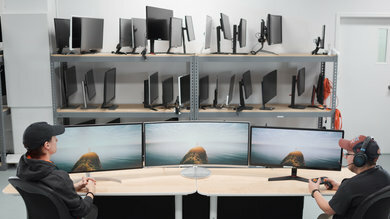 Middle: Samsung CF398. 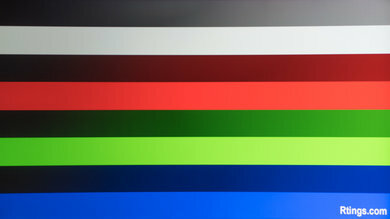 Right: ViewSonic XG2402. 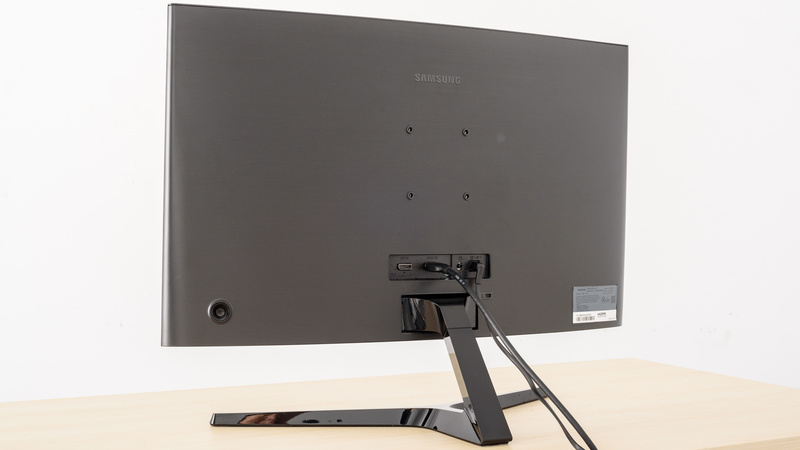 The Samsung CF398 is a decent entry-level monitor. 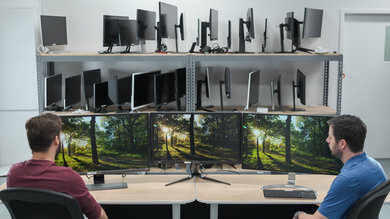 There are much better monitors out there if you are willing to spend even a little bit more. 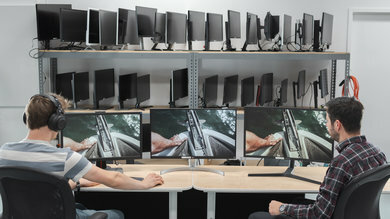 Check our recommendations for the best 27 inch monitors, the best budget gaming monitors and the best 1080p monitors. The HP 27F and the Samsung CF398 use different types of panels, each with their own strengths and weaknesses. 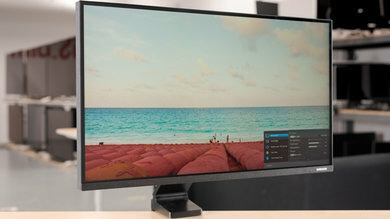 The 27F has an IPS panel, so the image remains accurate when viewed at an angle. 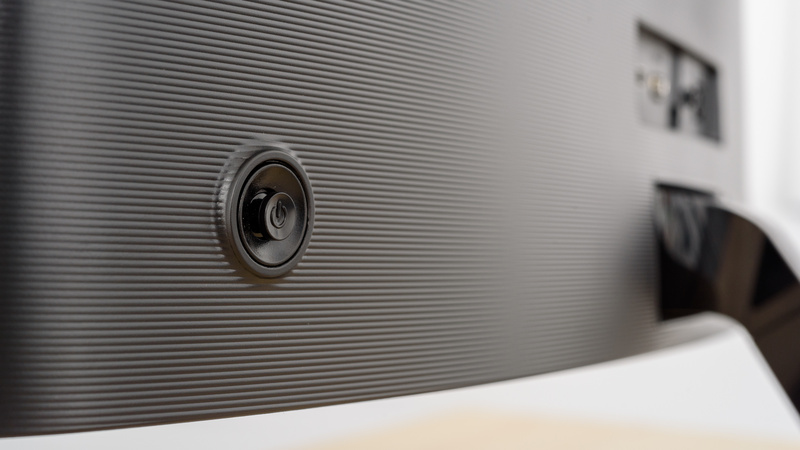 The CF398 has a VA panel, and it delivers better overall dark room performance. 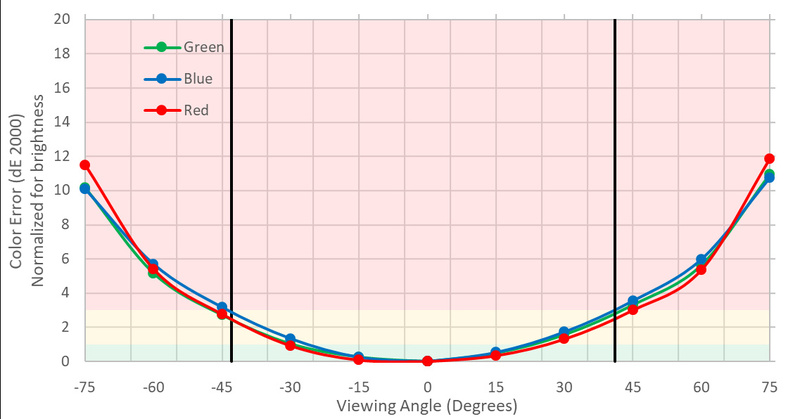 The HP 27F also has a slightly faster refresh rate, although it isn't a significant difference. The Samsung CF398 is much better than the Sceptre C325W. The Sceptre is a bit brighter and has a slightly better native contrast ratio, but worse black uniformity. 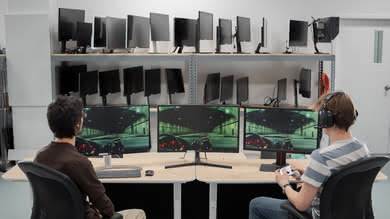 The CF398 has a much better response time with significantly less motion blur, and it supports AMD FreeSync. The CF398 also has lower input lag. The Samsung UJ590 is slightly better than the Samsung CF398. 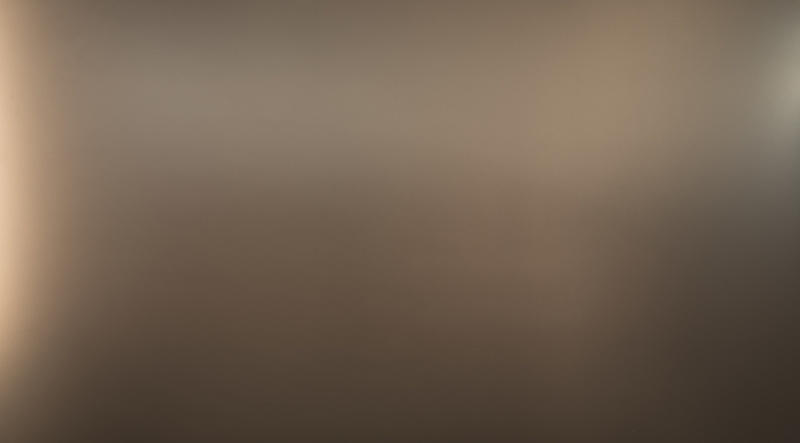 The UJ590 has a higher resolution, 4k screen that is better suited for multitasking. 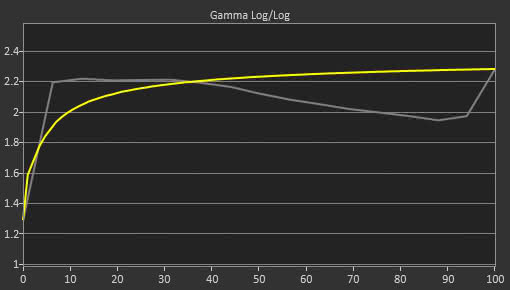 The CF398 is flicker-free, whereas the UJ590 has PWM flicker at low brightness levels. The Samsung CF398 is better than the MSI Optix G27C for most uses, but some people may prefer the Optix for gaming. 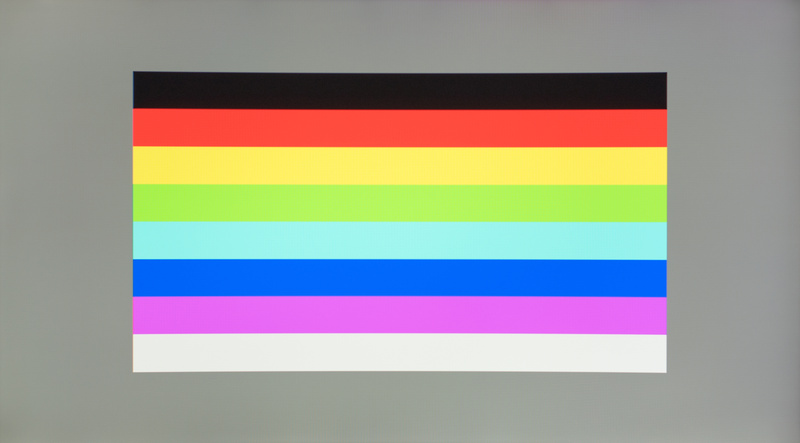 The Optix is a bit brighter and has slightly better native contrast, but worse black uniformity. The CF398 has wider viewing angles and better black uniformity. For gaming, the CF398 has a faster response time, but the Optix has a much faster refresh rate and lower input lag. 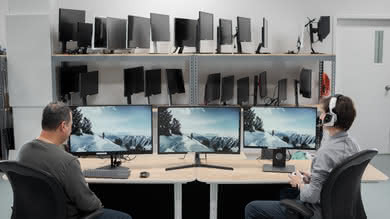 The Acer XF251Q is a 25" TN monitor, whereas the Samsung CF398 is a VA monitor. 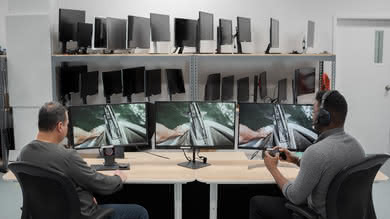 The XF251Q has better motion handling, thanks to a faster response time. 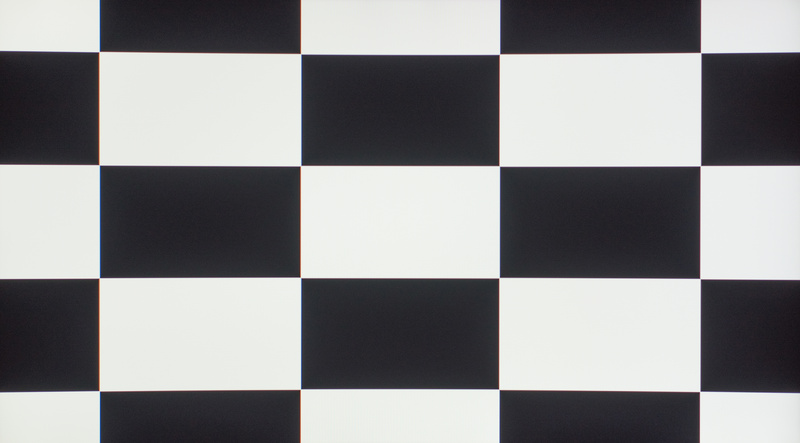 The XF251Q is a bit brighter, but the CF398 has much better native contrast, so it looks better in a dark room. 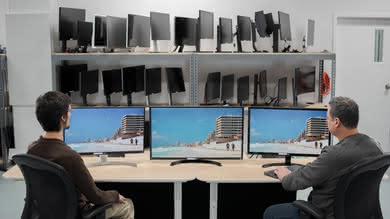 The Dell P2417H is a 24" IPS monitor, whereas the Samsung CF398 is a VA monitor. Generally, the P2417H is better than the CF398, but the CF398 is a bit better in some cases. 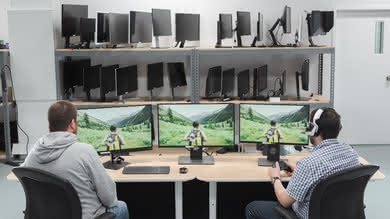 The P2417H has wide viewing angles and a much better, fully adjustable stand, making it a more versatile choice for most people. The CF398, on the other hand, has a faster response time, so motion looks clearer with less blur, and it supports FreeSync VRR. The Samsung CF398 and Samsung Space SR75 are very similar overall, each with their own strengths and weaknesses. The SR75 has a higher resolution screen and higher refresh rate, which is great for gaming. 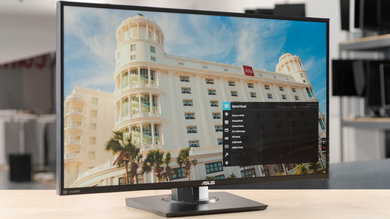 The CF398 supports FreeSync, and the image remains accurate when viewed at an angle. The Samsung CF398 is a decent monitor for most uses. It has a fixed stand that makes it hard to place in an ideal viewing position, and the image degrades when viewed at an angle. It has great reflections handling, but can't get very bright, so it might not be able to overcome glare in a really bright room. It has an excellent response time and low input lag, great for gaming or for watching movies. The 27" screen is good, but it is limited by the 1080p resolution that doesn't allow you to see many fine details in games or movies. Decent monitor for office use. The 27" screen is a good size for working, but the 1080p resolution isn't ideal for multitasking. Unfortunately, the image loses accuracy when viewed at an angle, and it has a fixed stand with terrible ergonomics. It has great reflections handling, but can't get bright enough to fight off bright glare in a well-lit office. 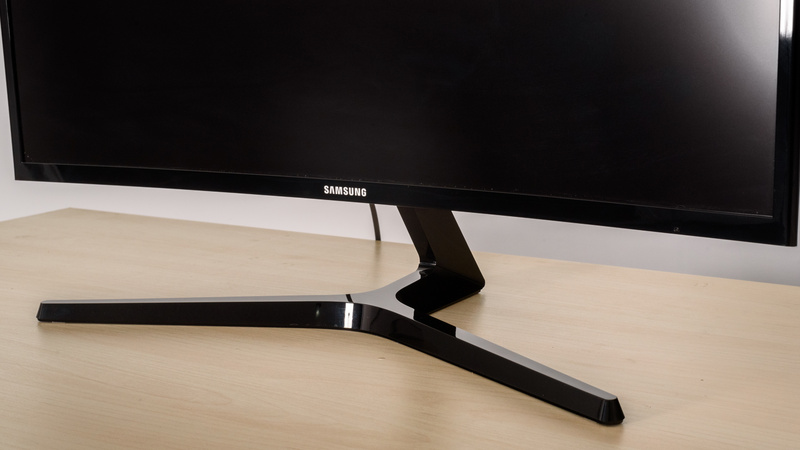 The Samsung C27F398 is a decent monitor for gaming. It has an excellent response time, low input lag, and it supports FreeSync VRR, which is great. 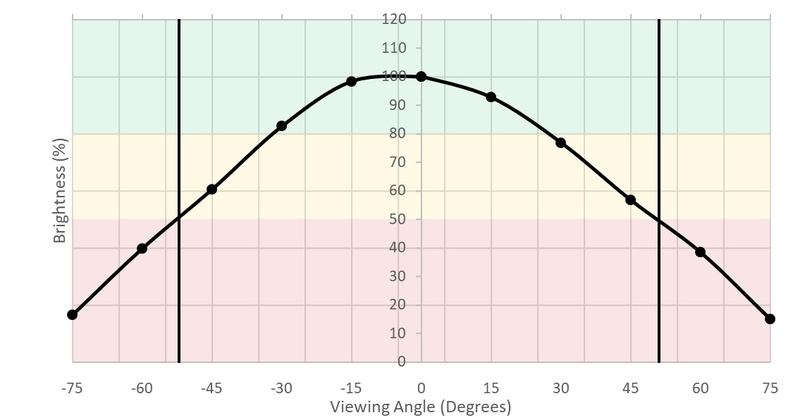 The standard 60 Hz refresh rate may be disappointing to some gamers. Although it can be easily increased to 72 Hz, this difference is minor and does not significantly improve the performance. 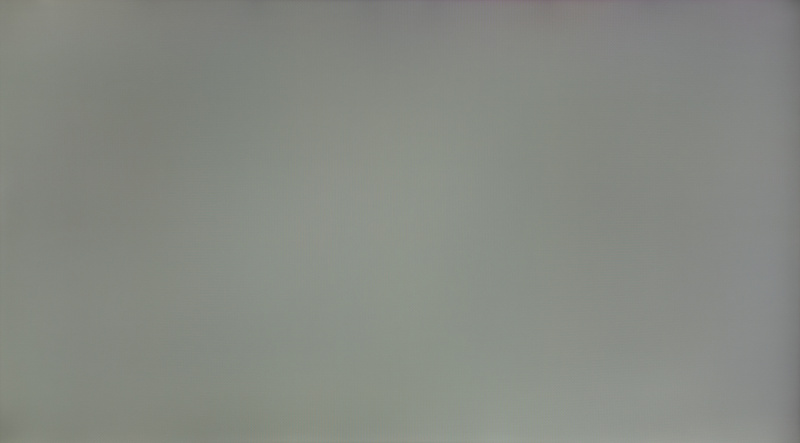 Unfortunately, the image degrades when viewed at an angle, and it can't get very bright. The Samsung C27F398 is an okay monitor for multimedia use. The 27" screen allows you to see some fine details, but it is limited by the 1080p resolution. Unfortunately, the image degrades when viewed at an angle, so it isn't great for sharing the latest YouTube trends with your friends. It has excellent low input lag, and a fast response time, so motion looks clear with little blur trail. Decent monitor for media creation. 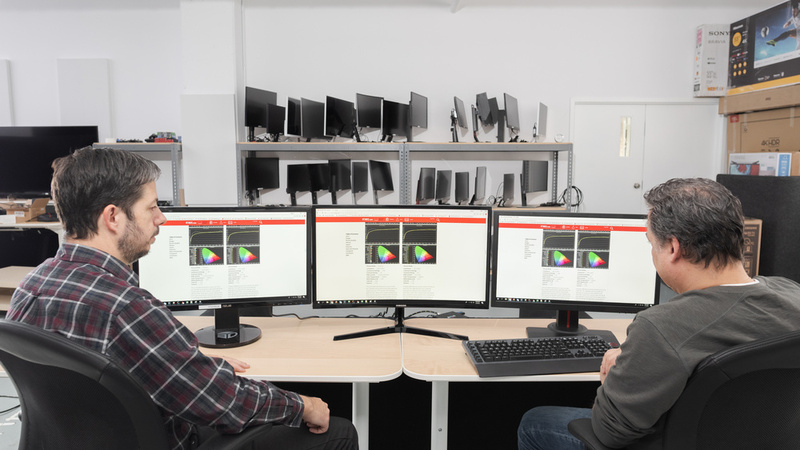 The 27" screen allows you to see fine details in your project, but the 1080p resolution means you'll have to zoom in and move your project around in order to see finer details. 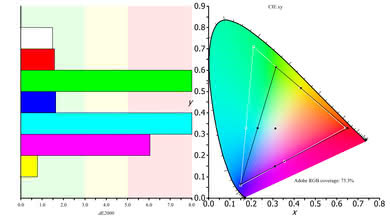 It has excellent coverage of the standard s.RGB color space, but the Adobe RGB coverage is less than ideal for professional photo or video editing. 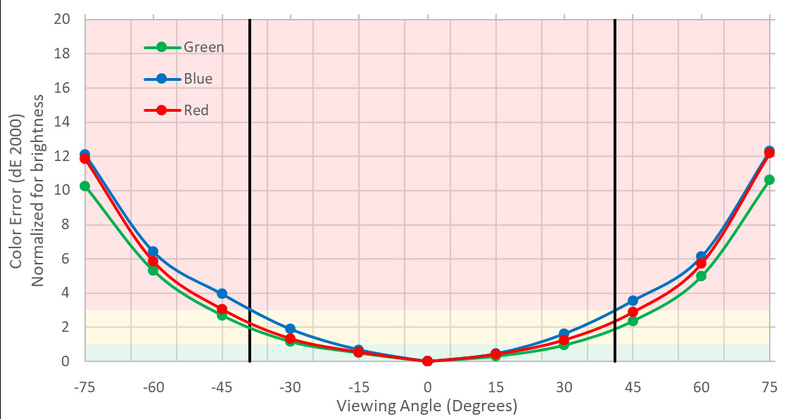 The Samsung C27F398FWN does not support HDR. 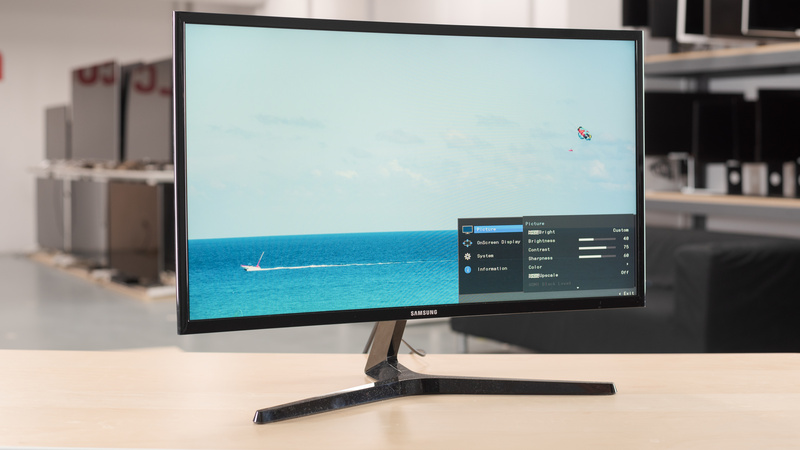 For a good HDR monitor, check out the Samsung CHG70.